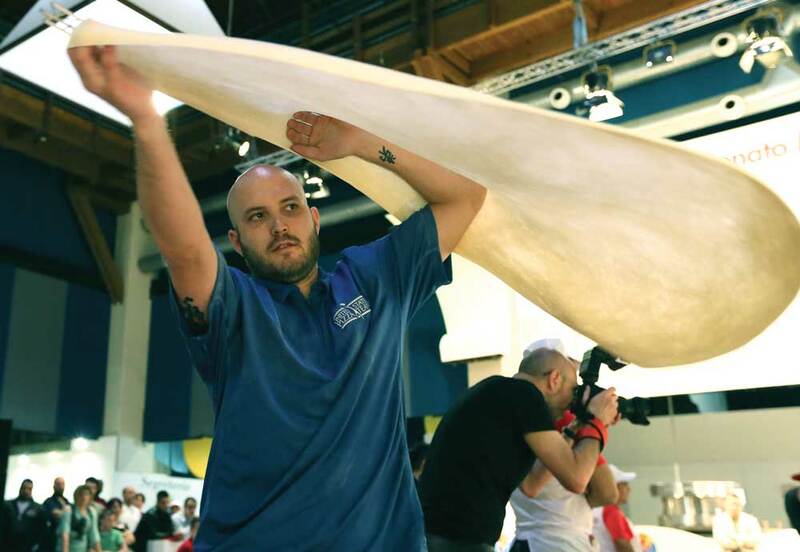 Bradley Johnson, an employee at a Mellow Mushroom store in Chattanooga, was all elbows as he expertly fashioned a dough canopy in the dough-stretching competition. Johnson’s girlfriend, Abby Robbins, also took part in the event this year. 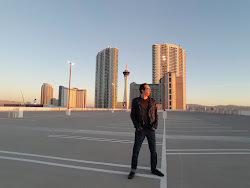 I call this blog Pizza Perspective because PERSPECTIVE is just what I’ve gained since I joined PMQ in December 2014. As a professional writer, reporter and editor who has worked extensively in the areas of defense, health care, sports and politics, I was skeptical, at first, about how compelling covering pizza could be. Frankly, I worried that I would get bored and lose my enthusiasm for telling dynamic stories. Well, pizza fans, I don’t have to tell you—pizza is cool! It’s all about your perspective. When I started at PMQ, I had just met our owner and founder Steve Green. It’s not a stretch—dough or otherwise—to say the guy lives and breathes pizza. Steve used to make, sell and market America’s favorite food for Domino’s—with remarkable success, mind you. That’s before the California native and Ole Miss transplant decided his real passion was sharing his marketing know-how with independent pizzeria operators around the world. Steve started PMQ as a simple newsletter in 1997. Today…well, you’re a PMQ.com and PMQ Pizza Magazine reader, so you know how far we’ve come, and you probably already share Steve’s pizza passion. Unlike me, back then. Sure, I always liked pizza fine, but I was a mere novice in internalizing the perfect blend of science, art, teamwork, salesmanship, ingenuity and bring-it-on risk taking that dictate success or failure in the $38.5 billion pizza game. Until I started meeting, profiling and photographing pizzaioli, I didn’t appreciate the revered, hard-earned power of that word. Never mind trying to figure out the correct tense. I was clueless as a chump who eats pizza with a knife and fork or thinks the best Neapolitan is ice cream. I had it all wrong, had no skin in the game. I was, DUH, lacking perspective. No more. I’ve watched some of the best American pizzaioli compete in the World Pizza Championship, in the birthplace of what began as fuel for the Roman legions. In lovely, food-celebrating Parma, Italy, the Americans gave their all for their professions and their teammates. They toiled with meticulous attention to detail, unique culinary skills and immeasurable pride in their craft. I’ve enjoyed seeing other expert pizza-makers from around the world in that same venue employ high-tech ovens and pizza peels with the same fluid precision you’d expect to find in a hospital surgery suite. I’ve strolled the cavernous display halls of the National Restaurant Association convention in Chicago where pizza hardware, software and gluten-free possibilities captured eyeballs, taste buds and imaginations. Who knew that an outfit called the American Pizza Council not only exists, but demands attention from the nation’s entire food-service complex? Most recently, I trailed a Canadian independent pizzeria owner—online nickname “Daddio”—to a Western Pizza Summit in Fort Lupton, Colorado, outside of Denver. Pizza Councils and Summits sound awfully high-falutin’—but ultimately it’s not the economic impact of pizza that changed my perspective on sauce, toppings and cheese lovingly layered on dough. It’s characters like PMQ Think Tank innovator and pizzeria (Daddio’s) owner Richard Daddio Ames, whose deadpan delivery belies a try-anything spirit. His marketing mettle led the Alberta, Canada, entrepreneur to wrap his delivery vehicles in low-light reflecting vinyl to promote the Daddio’s brand during the 18-hour Arctic nights in northern Canada. In the weeks ahead, Pizza Perspectives will share an inside view of the engaging personalities who make pizzerias special and beloved in America’s cultural mindset. I know that to most of you, pizza’s singular status and the unique talents wielded by the people who give pizza life is not earthshaking news. But it’s the vibrant legacy you share. I believe you’ll enjoy the stories, images and insights of your comrades in the endeavor we—yes, that includes me now—all cherish.